I’ve spent the last week deciding how I should restart. It kept me up a few nights, trying to think of something creative – but it all seemed too hard. Instead I’ll write something. Not exactly starting with a bang. Where have I been? Right here. I’ve written and deleted several versions explaining my absence. All of them were too truthful or way to vague. Let’s just agree I was busy and move on. I have to admit. 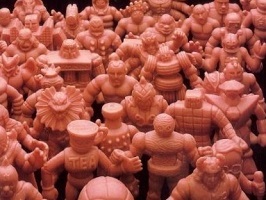 I didn’t miss anything related to M.U.S.C.L.E. and collecting. What I did miss was a creative outlet; something that was wholly mine and fun. But…the site wasn’t/isn’t always like that. If I’m going to continue this website, then blah, blah, blah. I’ve said this kind of stuff before. Moving forward I want to have more fun with the site. I’ve said that I wanted to have a positive impact on M.U.S.C.L.E. collecting. I do. But I’m no guardian, gate-keeper, or cop (not that I ever though I was). I just need to have some fun with the site. Occasionally that fun will be snarky or off-topic, but it just needs to be more fun. How delusional was I at the start of this website? I wanted a website that was serious, well-organized, and had an unbiased-voice for a ridiculous, muddled, highly personal niche of toys. This entry was posted on Thursday, January 23rd, 2014 and is filed under UofM News. You can follow any responses to this entry through RSS 2.0. You can skip to the end and leave a response. Pinging is currently not allowed.